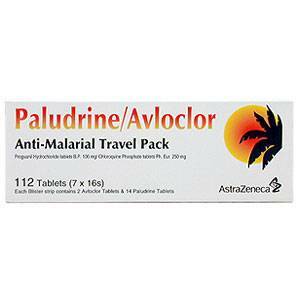 Paludrine tablets contain the active ingredient proguanil hydrochloride, which is an antimalarial medicine. It is used to prevent malaria. How does Paludrine work? Proguanil hydrochloride prevents malaria by stopping the parasite from reproducing once it is inside the red blood cells. It does this by blocking the action of a compound that is found in the Plasmodium parasite. This compound is an enzyme called dihydrofolate reductase, and is involved in the reproduction of the parasite.